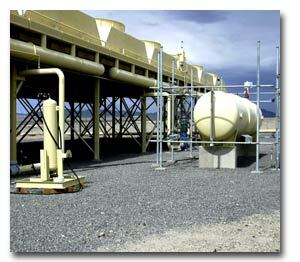 GDA has assembled general geothermal power plant engineering information that is adaptable to a wide range of geothermal resource conditions. An efficient and economical geothermal power plant requires appropriate and optimal use of its geothermal resource. Adequate testing of the geothermal resource to determine the character of the geothermal fluid (steam and/or brine) that will be delivered on a sustained basis, is a prime prerequisite. GDA will work with new project developers to obtain the data required for the proper power plant design and its estimated cost. There are basic major components in a geothermal power plant, such as the turbine, generator, gearbox, cooling system, lubrication system and electrical systems. The following .PDF files depict plan, elevation and isometric views of four single-flash plant configurations similar to those supplied by GDA for the Lihir Gold Ltd. mine and processing plant operations, Papua New Guinea. In these examples, General Electric CL-55 turbines were specified in both non-condensing and condensing configurations.